Safari in the first iOS 7 beta still has the same general look and feel of its predecessor, with an address bar at the top of the screen and menu bar at the bottom. Also included are the typical back, forward, share, bookmarks, and tab buttons. But once users scroll down on a page, those menus immediately disappear, allowing them to focus on the content. To return the menu bar and full-size address bar to the screen, users simply scroll upward on a webpage. The controls also automatically appear when a user scrolls completely to the top or bottom of a page. Previously, in iOS 6, the fullscreen browser mode was only available when using Safari in landscape orientation. In the first iOS 7 beta, not only is it available in portrait mode, it also doesn't need to be turned on  fullscreen browsing is now the only way to use Safari, with no current option to disable it. At the top of the screen is the new unified smart search box. Once users begin typing, a number of options appear, including "Top Hits," "Suggested Sites," "Google Search," "Bookmarks and History," and an "On This Page" search. In settings, the Smart Search Field can also be edited to disable "Search Suggestions," as well as a "Preload Top Hit" option. Another new Settings option is "AutoFill," which ties in with Apple's new cross-platform iCloud Keychain. Here, Safari can be set up to remember personal information, names and passwords, and even credit cards. iCloud Keychain can also be used with Safari to generate a unique, secure password. And data stored on iCloud is saved with 256-bit AES encryption. Users are prompted to store specific data on a site-by-site basis, and iCloud Keychain support will also come to OS X Mavericks when it debuts this fall. 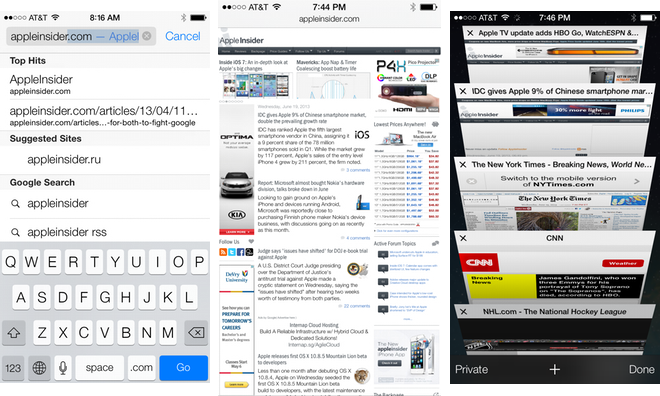 The new tab view in Safari in iOS 7 is reminiscent of Apple's Cover Flow user element. Currently open websites are presented in a scrollable 3D manner, and users can easily select a tab, or swipe it off-screen to close it. Scrolling to the bottom of the tabs presents iCloud Tabs that may be open Safari browsers on other devices. Both the tab and bookmarks menus also include quick links to the "Private" browsing mode in the bottom left corner. 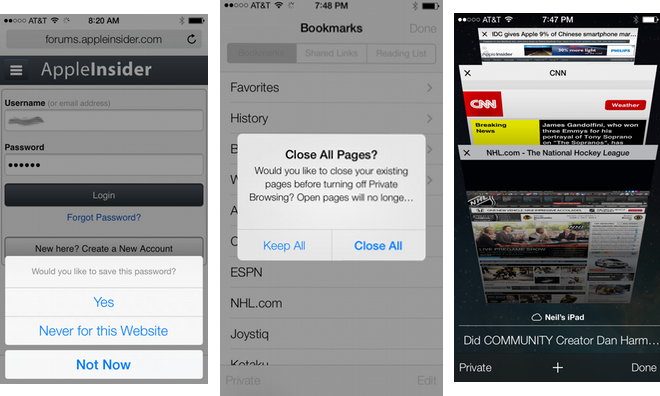 Once this is selected, Safari will ask if users wish to close all of their existing pages. When Private mode is enabled, the menu bars turn dark to remind the user. 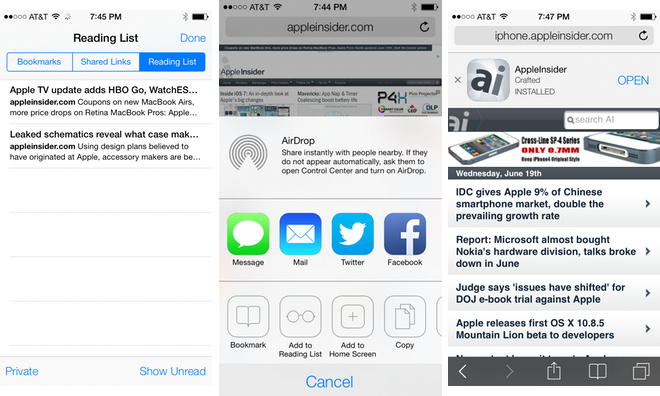 Also new to Safari in iOS 7 is a "Shared Links" option in the bookmarks menu. Here, users can view all of the URLs posted by people they follow in their Twitter timeline, further tightening iOS integration with the social networking service. The new mobile Safari will debut this fall when iOS 7 becomes available to the public. For more on Apple's upcoming mobile operating system update, see the other parts of AppleInsider's ongoing Inside iOS 7 series.